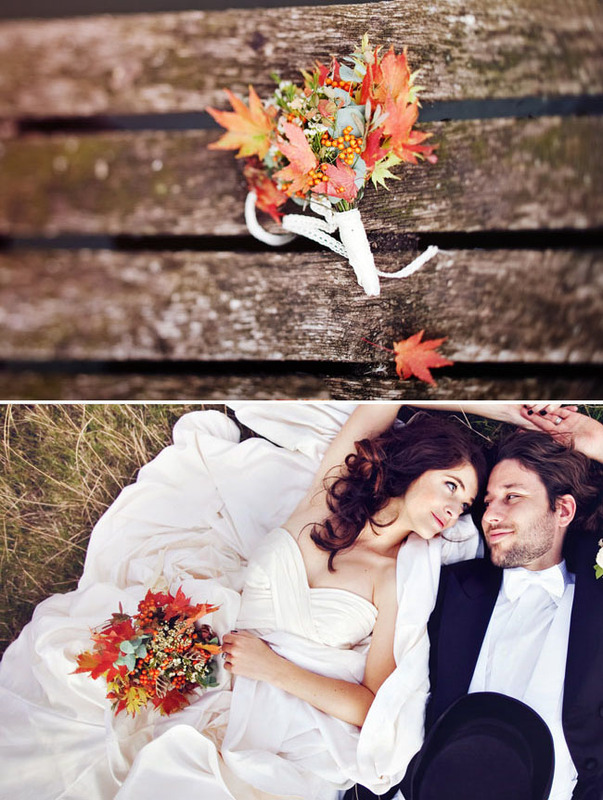 Another great alternative to fresh flowers for bouquets is to use dried flowers! This way you can DIY the bouquets in advance since it won’t matter (doing your own bouquets with real flowers can be a bit time consuming the day before the wedding when there is so much going on!) 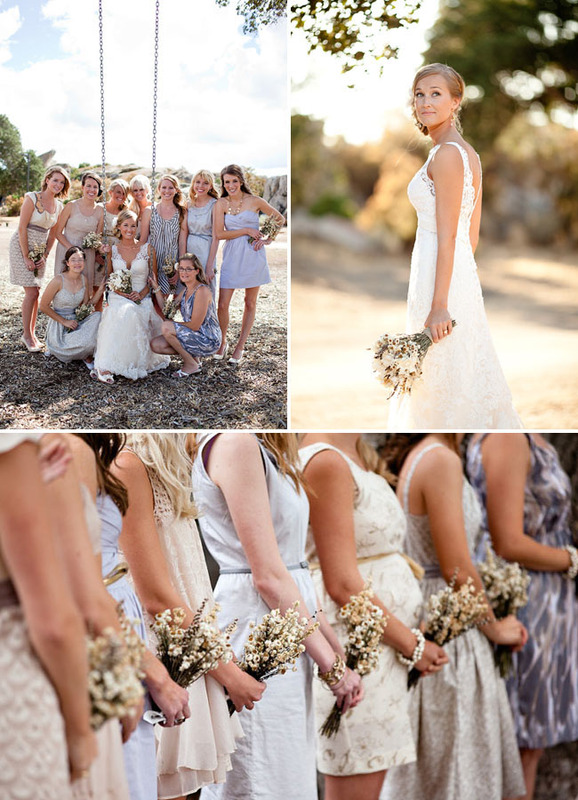 This elegant California wedding consisted of only dried flowers and is GORG! Photos by Sean Walker. 2. 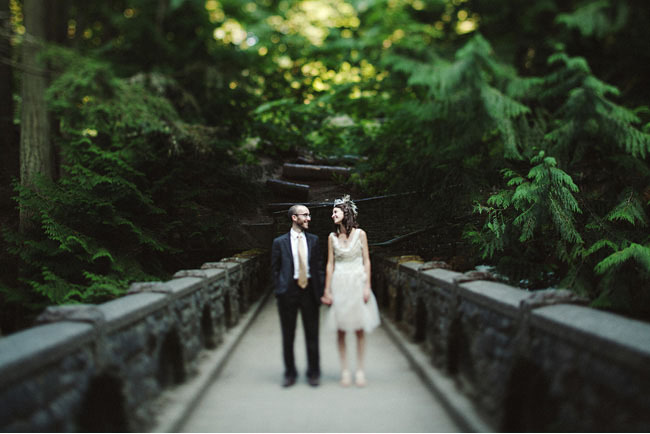 Get creative with your ceremony location. If you are looking for a less expensive ceremony location, here is a great idea from this adorable couple: they applied for a free permit and got married in a National Forest which cost them nothing! Beautiful location and the price is right. :) Another place to check are your local parks. We’ve featured quite a few couples who were married for free in a park, so be sure to check those out also. Photo below by Jonas Seaman. 3. Highlight your ceremony space with color + texture. 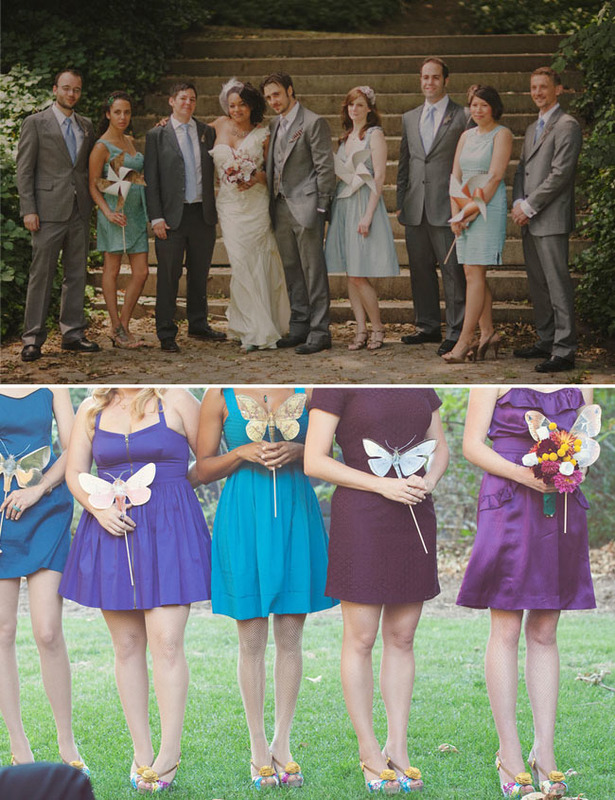 Looking for a fun way to make your ceremony space stand out – and on a budget? 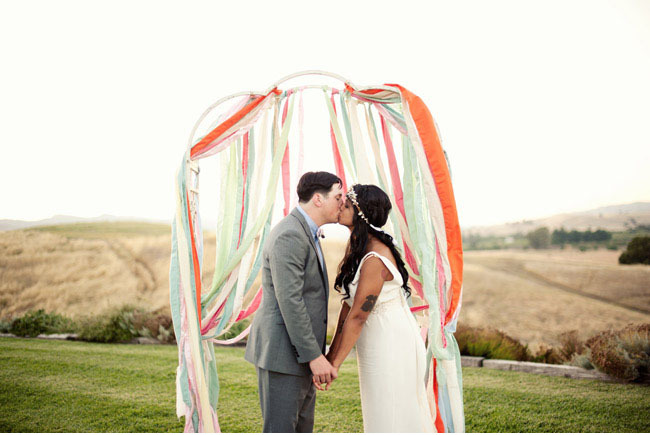 Try creating a ribbon display for your altar like this sweet couple did using crepe paper streamers! Makes a great visual piece to say your vows in front of and it’s super affordable. Another tip is to buy the streamers (you could also use ribbon) online to save even more money. Photo by Delbarr Moradi. 4. 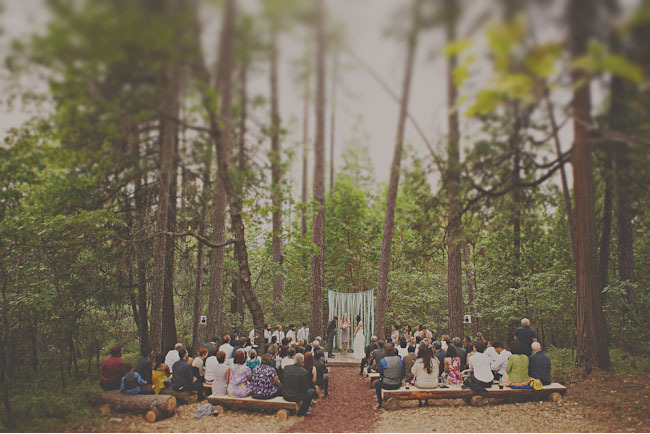 Create a ceremony stage with wood palettes. 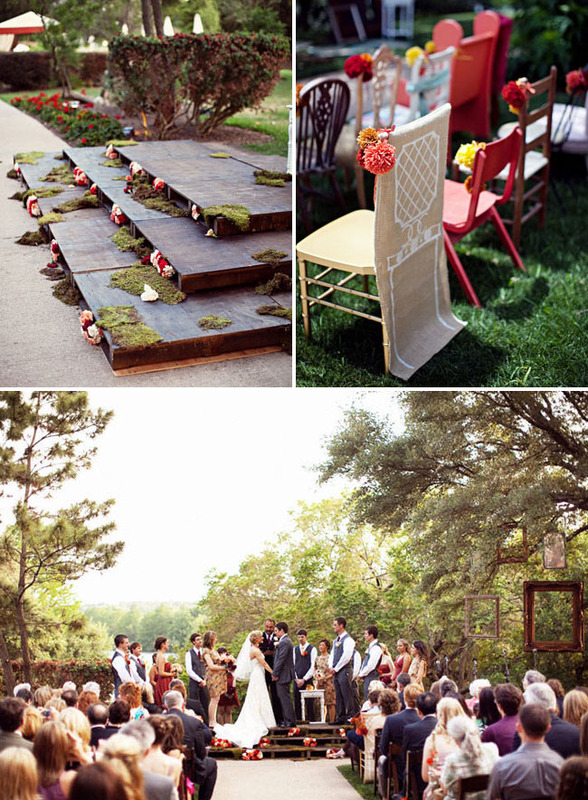 Here is another great ceremony idea from this Anthropologie inspired wedding – they created a stage with wood palettes. They also stained the wood + attached moss and flowers, but you could create your own spin on this idea to match your design style. It’s such a great way to make sure all your guests can see the two of you and on budget as you can pick up wood palettes for free from places like Home Depot. Photos by ee photography. 5. Finding affordable bridesmaids dresses. If you want to keep your lovely ladies happy, finding affordable (and dresses they love) is the way to go. That’s why I love this idea from this Philadelphia wedding – and the couple also found a local park to hold their ceremony in for free! 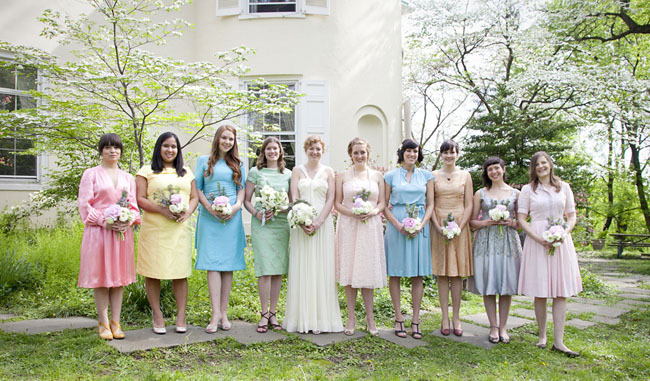 The bride asked her ladies to pick the following: a tea length dress, vintage, and in a pastel color. Those were the guidelines. All the ladies loved the dresses they found and get this, they all spent between $10-$20 on their dresses! They were either handmade, found at a thrift/vintage store, hand-me-down or bought off etsy. Great job ladies! Photo by Love Me Do Photography. 6. Fun centerpiece idea! This couple held a terrarium contest and had guests create the terrariums and drop them off the day before the wedding. The day of the wedding, the bride + groom judged them and then used them as their centerpieces – brilliant! Photos by Made U Look Photography. 8. Have a Pie Making Contest for your dessert bar. 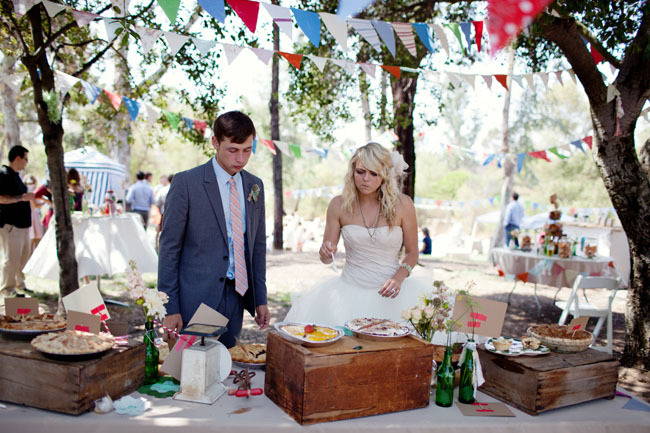 This adorable couple asked guests to bake their favorite pie and they then had a contest for their favorite pie at the wedding – which was a carnival theme, so fit in perfectly for them, but this could work for any wedding. 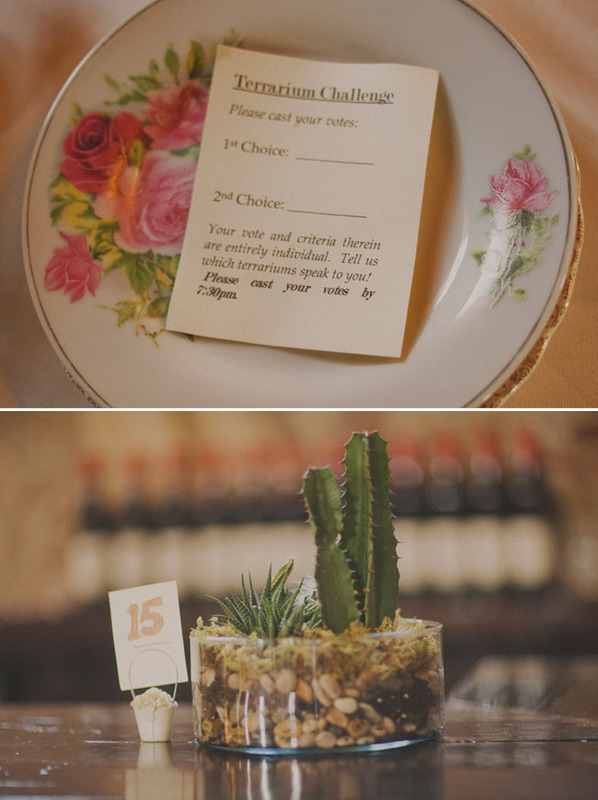 Super fun and you won’t have to worry about dessert for all your guests :) Photos by Katie Neal Photo. 9. How about a bike parade to a picnic reception? This adorable couple had a bike parade after their wedding ceremony and then the reception was a picnic in the park – super fun and saves lots of money on renting a reception venue space! Every time I see all the photos from the parade, I just wish I was there – looks so, so fun!! Photos by Rachel Thurston. 10. The Ultimate Drop Dead Gorgeous DIY Wedding. I called this wedding “the ultimate DIY wedding” since the couple and their family + friends did just about everything themselves including building the ceremony and reception sites, designing the invites, guestbook, ceremony backdrop, and so much more! So many great tips, advice + photos you can see here. Photos by Stone Crandall Photography. Anyone have any other DIY tips to add? I’d love to hear what you did that worked or what you are planning to do for the big day. Be sure to check out our other picks for 2011 below! Great tips, I especially like the flower ideas! LEAVES! AMAZING! We looked at parks and things but they have hidden costs: porta potties, tents, electricity, food, etc… It’s a serious DIY undertaking but if you have the time and support, as you’ve show here, look what can be done! Amazing tips! Thank you, this will definitely come in handy as I tackle my own wedding! Create your own props (like your own lemonade stand-http://greenweddingshoes.com/love-lemonade-an-engagement-session/), its your own touch on the wedding and something you can keep forever. Also, don’t be afraid to try something new and different when it comes to venues and vendors. It might take a bit more research but you can find lots of “gems” out there! This is especially good for those on a budget. Love it! These are some of my favorite posts that I have seen on your blog last year (mainly the terrariums). Great suggestions! I love the soft colors with the gold metallic accents – however, the silver jaguar is to die for!! Photography is amazing. Buy a used wedding dress! I found a dress that I loved in a bridal store and then bought it used for half the price and you couldnt tell it was used! That’s crazy! I know that exact bridge and have many memories there. It’s Whatcom Falls Park, I wouldn’t call it a forest. Have had 4 fashion shoots, an engagement shoot, and nearly got myself killed as I fell down a hill into the rocks of the waterfall. That is a great idea indeed. I love the streamers! I want to do something similar for our wedding but find the fabric or satin ribbons too expense. I need nearly 1000 metres! I was thinking of using the poly ribbon that florist’s use. Do you think this would work? I could use crepe-paper but am worried that the colours will bleed if it rains. Any advice? I loved the bike parade idea.